This week marks the first anniversary of Following Ezra’s publication. One of the questions people have been asking a lot lately is, “How’s the book doing?” They inquire in the way you might ask, “How’s your grandmother doing?” or, say, “How’s your wife?”—as if the book has a life of its own, heading out on road trips, occasionally nursing a cold, stopping off at Starbucks on the way to work each day. What I didn’t know was whether the book would find its way to people in that position. One of the most gratifying parts of sending the story out into the world has been hearing from so many mothers and fathers who are just where Shawn and I were a dozen years ago, trying to find their way in the dark. I have met many of them as I’ve traveled around the country to speak about the book. When I hear those things, I can only conclude that the book’s doing pretty well. Of course, the other question people ask is, “How’s Ezra doing?” The book ends with him at 13 years old, so many readers want to know what he’s been up to since then. The good news is that Ezra continues to surprise, delight, and challenge us every day (as do his brothers). He’s held onto his primary passions: animals and animation. On Labor Day, we visited the Los Angeles Zoo and he was beyond delighted at the opportunity to pet a hedgehog. 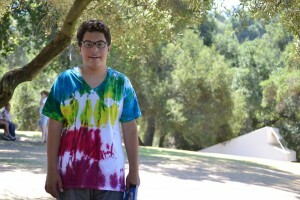 This summer he went to camp, where one of his electives was blogging. Every day he wrote a few sentences about his experiences: swimming in the pool, interviewing the cooking teacher, taking part in color war (wearing his favorite color: red). At moments like that, I think of those parents of younger kids, and of all the great moments that lie ahead for them. This entry was posted in autism, Parenting and tagged anniversary, autism, camp, father, parents, zoo. Bookmark the permalink. Post a comment or leave a trackback: Trackback URL. Again, beautifully written comments by a loving, caring parent. As always, so proud of you!